and is subsequently invited by their Kuala Lampur Chief for his ‘ESP’ Show at KL. When CA ( Computer Associates ) one of the world’s largest software company in India, decided to have their prestigious Client-Meet ( with Spouses ), it was decided to do it in grand style, at the Park Hyatt - Goa on 17th Feb. ’06. 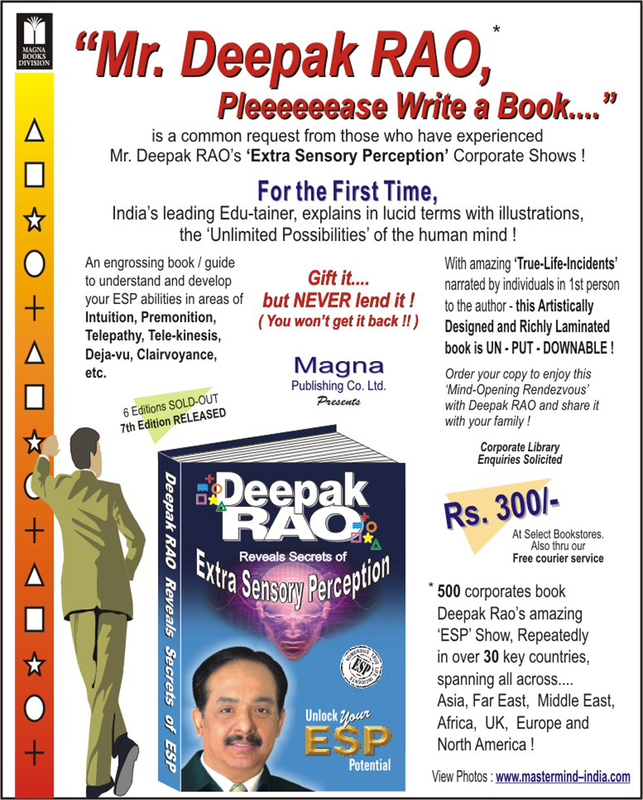 Corporate Honchos with their wives, along with senior executives of CA from over 50 IT companies, were exposed to Deepak RAO’s Mind-blowing ‘Extra Sensory Perception’ Show, that thoroughly entertained & enthralled one and all !! So baffling was the event, that visiting delegates from US & Malaysia almost suspected that their Indian Counterparts were hand-in-glove with Deepak RAO ( as jokingly mentioned to Mr. RAO ). To prove or disprove this theory, RAO was invited by the CA chief in Kuala Lampur and booked for his Fun Mind-Opening Training Sessions on Motivation and also for the ‘ESP’ Show. On 27th & 28th April ’06, the South Asian Conference consisting of delegates from Korea, Thailand, Singapore, Indonesia & Malaysia, experienced the two sessions.... something that they had NEVER ever seen before ! ‘Standing Ovation’ as usual, is what convinced, that there are ‘No Stooges’ involved in Deepak RAO’s ‘ESP’ Show !